The cell block, separated from the regular prison camp by a wall, served as a camp and as a Gestapo prison. It was a place awash in secrets about the abuse and murder which took place there. Only one building is still intact today from the around 80 original cells and guardrooms and interrogation rooms which existed in the T-shaped building. The remaining foundations of the two other wings are the only testimony to the fact that it did indeed exist. An exhibition which has been opened since 1999, including photos, drawings, documents and prisoner biographies, provides information about the history and functions of the cell block. The exhibition is very modestly designed, with narrow desks and display cases so that the impression of the cells can remain as authentic as possible. A model of the original, once three-winged cell block is also on display which was based on the panoptical design of corresponding types of penitentiaries of the time. The history of the building from 1936 to 1961 is shown in the first exhibition room. 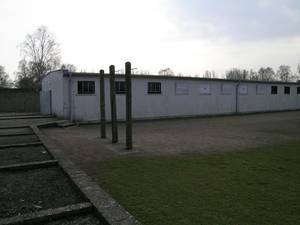 During the time of the concentration camp, the SS cell block served as a space where the camp’s prisoners were detained and punished. In addition, the Gestapo headquarters in Berlin used the cell block to imprison prominent special prisoners and those awaiting trial. During the time of the Soviet Special Camp from 1945-1950, the building was first used as a quarantine and then as a prison and collection point for the prisoners. In the 1950s, the cell block fell into disrepair. Military units of the Barracked People’s Police or the GDR’s National People’s Army reconstructed some installations for further use in other locations and dismantled parts of the building. In 1961, while constructing the National Memorial Site, the remaining section of the building was restored and was made into a museum. Visitors can see the cells set up as they were designed during that time period; for example, a cell is shown with a straw mattress or with a bed and a chair. The second room deals with the so-called camp punishments, which would be carried out in the cell block by the SS. One of the main instruments of terror was that all of the concentration camps maintained almost identical camp rules and regulations for punishment. Any perceived violation of the camp’s rules would be punished by isolation, light deprivation, corporal punishment or by being hung on a pole for hours with the hands tied behind the back. The SS also locked prisoners up in the cell block specifically in order to be able to torture and murder them away from the eyes of the camp’s other prisoners. Prisoners’ drawings and reports are contrasted with the orders and commands of the SS. In the third room, the exhibition uses examples to document the fate of the Gestapo’s special prisoners and those awaiting trial who were imprisoned here. The communist Herbert Nicolai, Hitler’s would-be assassinator Georg Elser, the Polish suffragan bishop Wladyslaw Goral, the French Prime Minister Paul Reynaud, as well as the Secretary of State for Foreign Affairs Martin Luther. These prisoners’ detainment conditions varied significantly depending on how much importance was accorded them by the Gestapo. The length of their imprisonment in the cell block also varied in the same way, the prisoners who were awaiting trial were held here for a few days, weeks or months, and the special prisoners often remained here for several years. A part of the museum’s reconception in 1999 is also the inclusion of a space for changing exhibitions in which the cell block’s prisoners or prisoner groups are portrayed in more detail.